The area of Barisan Selatan Hill National Park is inhabited by tens kinds of forest bats, various kinds of rare animals and also various kinds of plants in the world (based on information from UNESCO). This forest area is located in Lampung and Bengkulu, where the data of the species have been taken. There are kinds of plants, such as beach-tree (Sonneratia sp. ), nipah (Nypa fruticans), sea fir tree (Casuarina equisetifolia), pandan (Pandanus sp. ), gardenia (Michelia champaka), meranti (Shorea sp. ), mersawa (Anisoptera curtisii), ramin (Gonystylus bancanus), keruing (Dipterocarpus sp. ), resin (Agathis sp. ), rattan (Calamus sp. ), and rafflesia flower (Rafflesia arnoldi). Besides, there are also many kinds of animals, for instance 118 kinds of mammals, 7 kinds of primates, 425 birds, 9 kinds of rangkong, 91 kinds of reptiles and amphibians, and 51 kinds of fish, honey bear, Sumatran rhinoceros, Sumatran tigers, Sumatran elephants, etc. 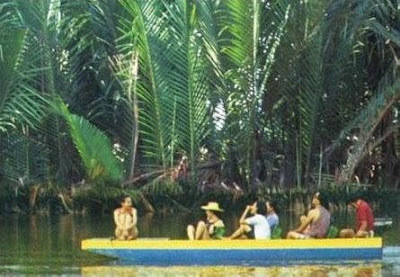 In this tour location, visitors can explore the forest, swim, row a small boat, watch the flowers inside the forest, go camping, and go along the river. The plants, which become special character of this national park, are tall and long Amorphophalus flowers (Amorphophalus decus-silvae), giant Amorphophalus flowers (A. titanum), and giant orchids (Grammatophylum speciosum). The height of tall and long Amorphophalus flower can reach more than 2 meters. This forest location includes Tanggamus, West Lampung, and Bengkulu Districts.